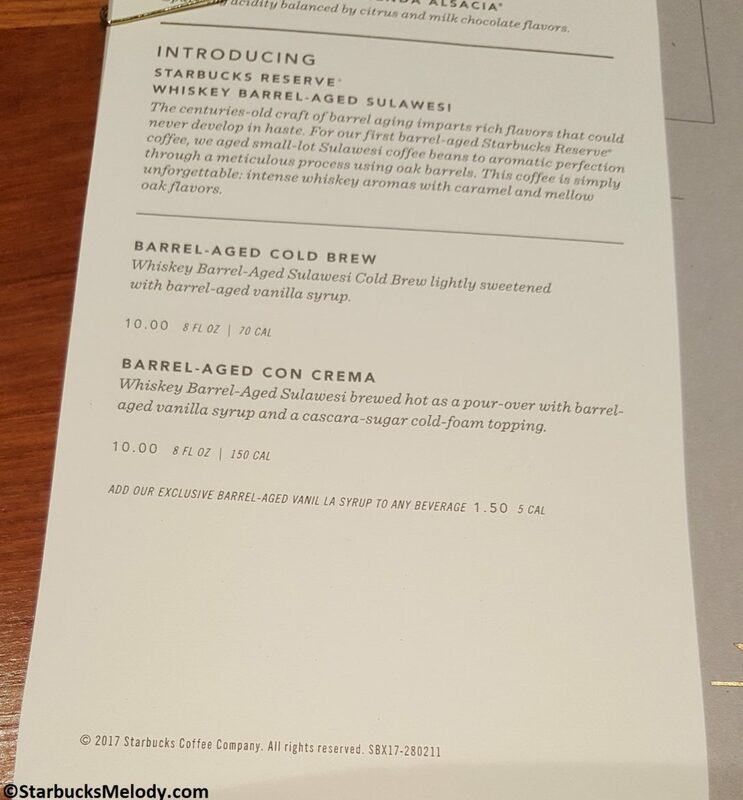 Starbucks has taken beverage innovation in a whole new direction: Whiskey is now involved. New, as of March 6th, you will find two drinks made with a special blend, using Sulawesi beans aged for a couple of months in whiskey barrels. Then after months of green, unroasted coffee absorbing flavor and aroma from the barrel, finally Starbucks roasts the coffee. The Sulawesi has such a powerful odor from the aging process, that this new coffee blend is roasted off site so that it doesn’t interfere with other aromas and operations at the Roastery. Several years ago, I visited the Starbucks “Pilot Plant,” which is an area of roasting operations in the basement level of the Starbucks headquarters, designed for special roasting projects as well as ongoing testing and perfecting of coffee blends. The actual whiskey barrel-aged Sulawesi is roasted at that Pilot Plant. I wish I could go watch it being roasted! 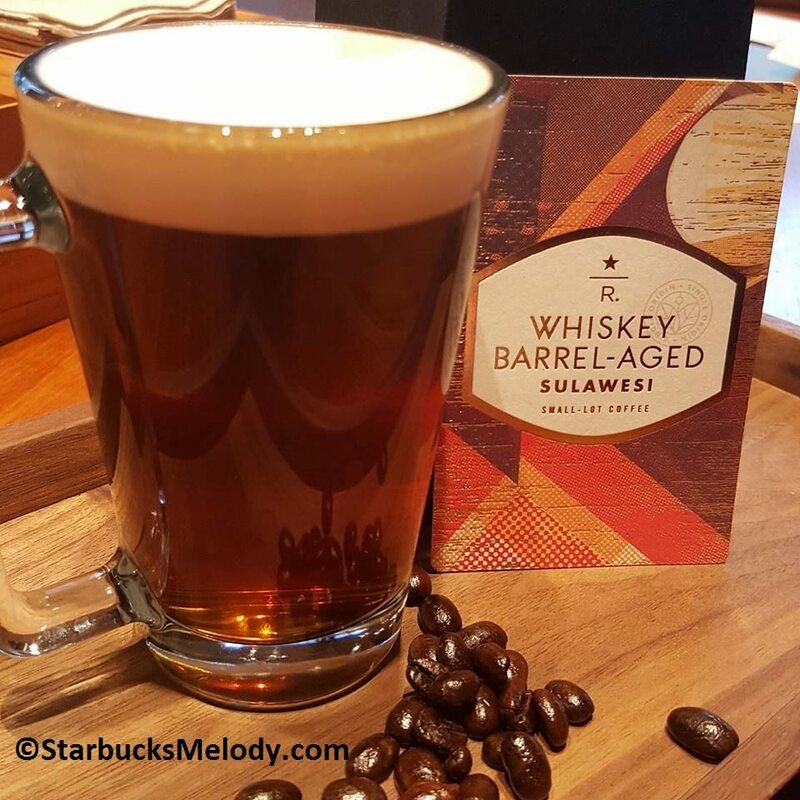 Barrel Aged Cold Brew starts with slow-steeped Whiskey Barrel-Aged Sulawesi and an un-aged Starbucks Reserve® Sulawesi. Baristas lightly sweeten the beverage with the vanilla syrup in a carafe and as a sidecar next to a glass with a large, clear cube of ice. Barrel Aged Con Crema, which is a pour-over of 100 percent Whiskey Barrel Aged Sulawesi mixed with barrel-aged vanilla syrup, topped with cascara sugar cold foam topping. The vanilla used in the above drinks is also staged in whiskey barrels for the same reason: The special vanilla in the above drinks also has hints of flavors from whiskey barrels. The new coffee really smells like whiskey! The beans really do pick up A LOT of the whiskey flavor from the barrels. The whole bean whiskey barrel-aged Sulawesi is so flavorful and aromatic that it will have its own specially-designated grinders at the Roastery – you can be assured that it will not affect any of your other coffee purchases. There will be no residue of whiskey barrel-aged Sulawesi in your other coffee beverages. Having tried the two above new beverages, I can say they are fantastic. The Barrel Aged Sulawesi con Crema tastes like it has an Irish cream flavor to it! The cold brew has this light but distinctive Irish cream whiskey flavor. The whole bean coffee is also for sale at the Roastery. When you buy the whole bean, you’re buying just the Whiskey Barrel-Aged Sulawesi. The Cold Brew at the Roastery is actually made with the Sulawesi and a blend of other beans. The Whiskey Barrel Aged Con Crema is made with just the Sulawesi, not a blend. What’s interesting is that the innovation pipeline for this new coffee and drinks began long before the Roastery opened. The R & D team spent a long time trying other coffees in whiskey barrels to see what would work. For example if you age Sumatra for 3 months in whiskey barrels and decide that doesn’t taste great, then you have to start over! I believe the R & D team for this project started with Sumatra as an idea before decided that Sulawesi worked the best. This is a Roastery exclusive coffee. How to enjoy Girl Scout Cookies with Starbucks Coffee. 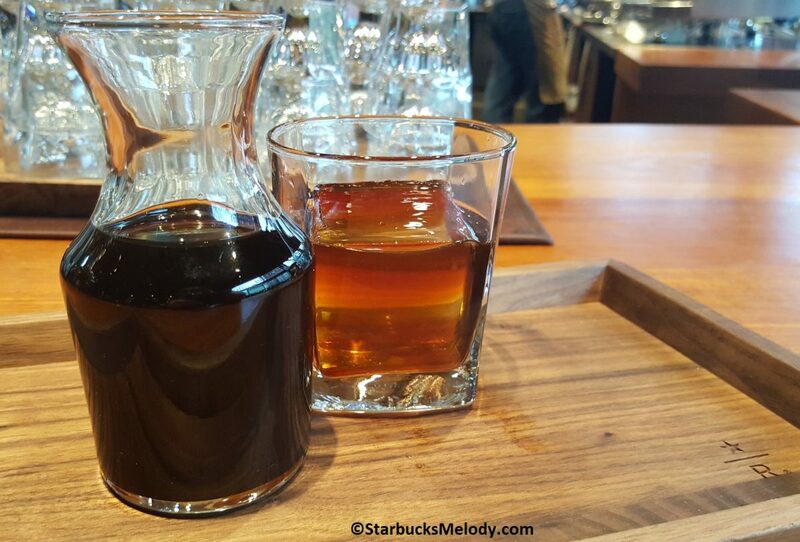 Tahoe Blend: Starbucks Custom Blends (Open Thread). Discover your barista’s drink creativity: Barista Originals. I need this in my life! How can I get some here in Ohio? wow, i just noticed the price tag! how much are they selling it for 1/4 pound?! @Jocelyn – Yes you are right. The profit on the beverages must be incredible. But Starbucks as whole is SOOOO extremely profitable. The weird thing is that the whole bean isn’t that bad. My recollection is that it’s priced just below Panama Carmen Estate with was $20 for 8 ounces, I think. Actually I am going to go back and double check the pricing because I’m not sure I’m telling you right. I will update the article later. What a wonderful resource to be able to learn about these coffees through your page, Melody. I have loved it from day one, and I continue to be intrigued with all the information. Coffee information/education continue to be my favorite articles. I cannot wait to try this coffee.